Auctions are a great way for your company to acquire construction equipment. 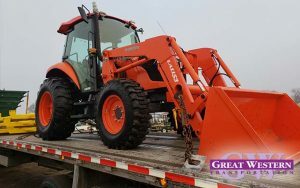 Online auction websites and professional auctioneers help you find reliable used equipment at good prices, but it won’t do you any good to outbid someone for your dream excavator if you then have to spend too much on bringing it back to your warehouse or you can’t pick it up. There are a few things you need to consider about the logistics of moving equipment before you place your bid. Most construction equipment is pretty big and oddly-shaped. They may best fit on flatbeds, as the open sides make it easier to load and you don’t have to worry about the top of the item scraping the ceiling. Occasionally, equipment is so large that it will need special permits to be carried out. In those instances, you might have to spring for Heavy Haul Trucking. Recording the weight, height, width, and length of any item that you are considering purchasing will allow you to assess what type of transportation you will need, which will in turn let you pick a transportation company that can handle the item you are ordering. The people selling the items generally want their wares off their premises as soon as possible. After all, they have to pay to store their inventory, and the thing is taking up a lot of room that could be put to other uses. 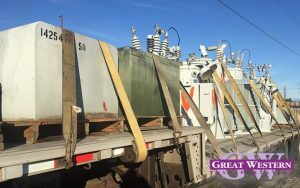 They may give you as little as 24 to 48 hours to pick up the equipment, and you will have to coordinate with them to make sure that you get your purchase on a truck within the specified time frame. Having the appropriately sized truck and properly licensed driver ready to roll as soon as you make your purchase will help. If you are looking to buy some of your construction equipment at an auction, you will want to hire a trucking company that will be able to handle what you order quickly, and Great Western Transportation prides itself in being one of those companies. We have the experience in heavy haul trucking for oversized construction equipment and a variety of flatbed trailers that are ideal for transporting them. Before you buy at auction, contact us for a quote. LTL Trucking or less-than-truckload trucking is a great solution if you don’t need a full truck to transport your goods. 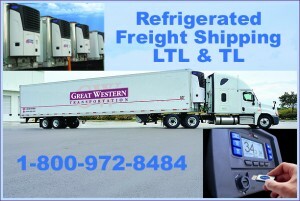 But LTL refrigerated trucking is a service that’s much more specific. You opt for LTL refrigerated trucking when you need perishable items transported, but they don’t require a full truck in order to do so. In this situation, your items share truck space with other freight. Trucking companies that offer LTL trucking services don’t require a full truckload or trailer of contents. They either offer smaller trailers containing other freight or they’ll send full-size trailers with multiple shippers’ goods. LTL refrigerated trucks can be useful when you need to ship sensitive freight, but can’t afford to wait to fill an entire truckload because goods awaiting shipment will perish in the meantime. Refrigerated LTL trucking operates on a very limited and specific schedule. Because items that are perishable require refrigerated trucking, it can be harder to schedule a shipment when sensitive freight must share a trailer with other sensitive freight. This means that LTLs must find multiple clients whose products need to be shipped within the same timeline, at the same temperature range. For example, you can’t put frozen vegetables on the same truck as produce only requires refrigeration. Frozen products must be grouped with similar items. The same goes for any other products that require similar temperatures to stay fresh. 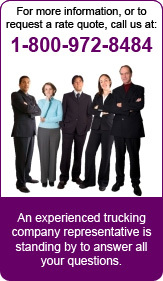 This is not always easy to accomplish and takes a very experienced LTL to execute effectively. Perishable items must be delivered quickly. If not, clients can lose a considerable amount of money due to wasted product. It’s best to go with a company that offers expedited transit times. 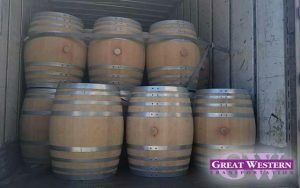 At Great Western Transportation, we handle time-sensitive LTL refrigerated shipments throughout the Continental United States and Canada. Our experienced drivers will deliver your chilled, frozen and temperature controlled truckload and LTL shipments at competitive rates. For more information about our trucking services, don’t hesitate to contact us or give us a call at 1-800-972-8484 today. For any shipper, finding a good dry freight trucking company is the number one priority in ensuring their goods are in good hands. On the other hand, trucking companies have the sole responsibility to ensure the security and safety of your cargo or risk facing possible liability charges. To avoid getting poor transportation services and to ensure the trucking company of your choice will satisfy your transportation needs, here are some of the pointers to look out for in a good dry freight trucking services. Sometimes your freight may not come from the same geographical position. Your customers may not all originate from the same location. A good dry freight trucking services company should have extensive networks in place to facilitate transportation of your cargo even across borders. One of the ways trucking businesses can gain the trust of the customer is to involve them in the shipping process wholly. The trucking company should have surveillance measures in place to track and monitor the drivers in real-time to know where the freight has reached at any particular time. The information then gets relayed to the customer who in turn feels their cargo is in good hands. Sometimes the freight many not come as bigger as last time. Your trucking company should have the means to get you dry freight vans in different sizes for competitive prices depending on your load size. Some companies have a policy about pickup points and dropping points. Your trucking company should facilitate picking your freight from wherever it is at any time to ensure efficiency and customer satisfaction. It will not only increase convenience, but it will also save you more cost to transport the freight to a pickup point. Refrigerated trucking is a specialized form of trucking service designed specifically for safely transporting perishable items, such as foodstuff. Businesses that need to have grocery items shipped from one location to another (even if it’s a short distance), need refrigerated trucking. In this post, we’ll introduce you to the benefits of refrigerated trucking and why you business might need it. Protection: If you are transporting items like dairy products, you need a transportation vehicle that can safely get said items to a particular destination without going bad and getting spoiled. A refrigerated truck will use the proper temperatures so the items do not get damaged (like vegetables that could be exposed to severely cold temperatures). Finally, a refrigerated truck will protect against harsh weather elements that likely would impact the quality and safety of the items being shipped. It Can Be Used For Multiple Purposes: Typically the first thing that comes to mind when hearing about refrigerated trucking is perishable items like dairy, prepared meals, and meats. However, refrigerated trucking serves a wide variety of purposes and isn’t just for businesses that sell grocery items. If you need to ship such things as plants, personal care products, or pharmaceuticals, you simply can’t transport these things in a traditional vehicle. They’ll need to be shipped in a refrigerated truck to fully protect each item from damage. These Things Will Always Need to be Transported: Produce and other such items will always be in high demand, thus they will always need to be transported to and from different places. To fully protect your business and the customers who are buying your products, it is imperative that you keep all items fully protect during the transportation process. Are you in need of a refrigerated truck or is there another trucking service you require? Don’t hesitate to contact us today! 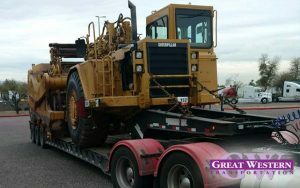 There are many transport options when it comes to shipping heavy construction equipment. Two popular methods to ship heavy machinery such as cranes, excavators, and bulldozers are flatbed trucking and heavy haul trucking. Which is better? Using flatbed trailers allows you great flexibility in transporting your construction equipment because it carries loads that are wide, over length, oversized, overweight, or any combination of these load types. Flatbeds are ideal for transporting heavy loads and equipment that are not delicate or vulnerable to precipitation such as construction equipment, for example. Sometimes, items will be covered with a tarp to prevent weather from damaging the freight. Flatbed trailers may be unloaded from the sides, from the top, or from behind, making unloading easier. If your shipment is too tall, wide, or heavy, then it’s best to go with heavy haul trucking. A heavy haul truck consists of a truck tractor with an attached trailer. When using a heavy haul truck, the load will need permits (in terms of length, width, height, and weight) set for a particular state. When hauling a heavy haul load, it could take a few hours or a couple days to get permits depending on the state. WHICH MODE OF TRANSPORT IS BETTER? It depends on your shipping needs. If you have construction equipment that is heavier, taller, longer, or wider, it’s best to get a heavy haul truck. But if you just have equipment that meets the routine permit limits, a flatbed truck should be sufficient. 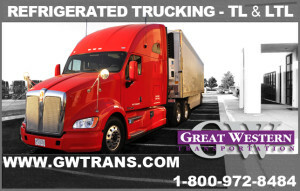 Here at Great Western Transportation, we have an experienced team that has the knowledge and access to required equipment necessary to meet your heavy haul trucking needs. 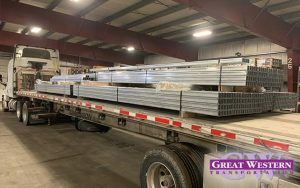 We also specialize in flatbed trucking with a variety of trailer types that are designed to fit the many needs required by different shipments either based on size or how they need to be loaded. Need your construction equipment transported? Contact us for a quote today. Backing up a commercial flatbed truck can be a very dangerous task, especially if you are new to the field. We are passionate about safety at Great Western Transportation. Since we’re the leader in the industry when it comes to offering complete trucking services, we’ve gathered some helpful tips for drivers who need to safely maneuver their large vehicle. Read on to learn more about how you can safely backup a flatbed truck. Our first tip is to be alert and constantly check the road for cross-traffic. We recommend that you never back up the flatbed truck into an intersection unless there is no other option. You should also make sure there is enough space around your vehicle. When in doubt, get out of the truck to look at the situation up close to see if you have enough room. Take your time when you are trying to backup into a loading dock or next to a building. One wrong move could damage the building or the vehicle. You should always be aware if your flatbed truck can clear what’s on the road. After all, you don’t want to get stuck. Check to see if there is enough clearance so you can safely backup the truck. Another tip is to not rely solely on mirrors. Mirrors can do not show accurate depictions of where items are around your vehicle. Get out of the truck sometimes to observe the situation to make sure you can move the car without incident. Never back the flatbed truck up into a blind alleyway or any other area where you can’t see too well. If someone is behind your truck, regardless if it’s a vehicle or a person, err on the side of caution and give them the right of way before you start to backup the vehicle. For more information about our services, please contact us today online or call us at (800) 972-8484.